For well over a century, National Geographic has been bringing the world’s wildlife, landscapes, and cultures to our homes in the form of an iconic magazine, incredible photography, and television programming. Now, the esteemed publication is broadening our perspective on an unexpected but welcome topic: beer. 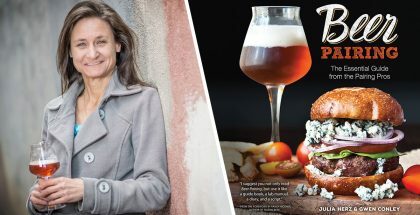 Atlas of Beer, written by Nat Geo Explorers and university professors Nancy Hoalst-Pullen and Mark W. Patterson, offers a comprehensive look at brewing and beer appreciation throughout the world’s cultures. Devoting ample space to every settled continent, Atlas of Beer is an ambitious project and a fascinating read. While the information on Europe and North America might be familiar to many seasoned beer fans on these shores, the chapters on Africa, South America, Asia, and Oceania will provide tremendous insight into how beer is brewed and enjoyed by the greater-than-eighty-percent of the world’s population that lives in those places. The research undertaken by the authors is impressive, and I appreciated the depth and scope of the historical and cultural information provided. This is not a travel guide or a light, surface-level diversion. Atlas of Beer takes the time to lay out the full historical background and current brewing climate for over two dozen featured counties, providing sufficient context to better understand the beers and drinkers of these varied nations. 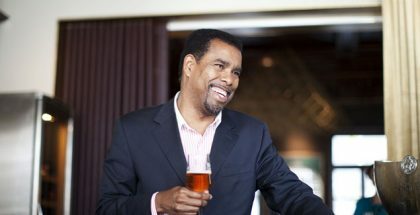 In addition to historical, cultural, and stylistic information, Atlas of Beer also benefits from the expertise of Garrett Oliver, esteemed Brooklyn Brewery brewmaster and author of The Brewmaster’s Table. Oliver provides one or two style descriptions, beer recommendations, and pairing suggestions for most of the countries discussed. 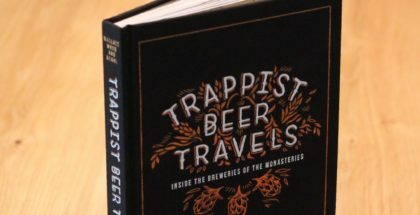 Both Hoalst-Pullen and Patterson are professors of geography, and in keeping with their profession and National Geographic’s stated purpose, Atlas of Beer instills the importance of place in the creation and appreciation of our favorite drink. Beer styles and interpretations develop at specific places and specific times, and understanding those places and times helps us better understand beer. Similarly, there is no substitute for being able to enjoy and evaluate a beer in its homeland, in the same climate and culture that birthed it. The book’s historical and cultural information, excellent maps and illustrations, and gorgeous full-page photography help us better understand this significance, and hopefully motivate us to seek out more authentic drinking experiences. 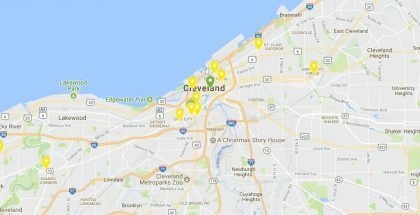 I recently had the chance to speak with Nancy Hoalst-Pullen and Mark W. Patterson about Atlas of Beer, the importance of place, and, of course, their favorites beers. PD: Tell us a little about your own backgrounds in beer. Mark W. Patterson: I used to steal sips of beer from my dad’s glass when I was 8. It was Molson Canadian. I brewed my first beer in 1991, a cream ale. It turned out okay. I still home brew today when time permits. I think we tried close to 2,700 different beers in the last 2.5 years, so we are getting a refined palette. We also teach a course called the Geography of Beer, and take students to Europe on study abroad programs to visit breweries and learn about different beer styles from a geographic perspective. We’ve also hosted tastings and given numerous talks on beer and its geography. Nancy Hoalst-Pullen: My beer drinking was pretty standard in college, drinking the cheapest stuff possible. Of course, this was before the craft beer explosion and today’s golden age of beer, so the quality and styles were limited at best. When I moved to Colorado in 2001, there were several fledgling (and now much bigger) breweries and brewpubs, trying out new styles and brewing processes that were quite exciting at the time. I always have had a penchant to try new things, so it didn’t take long to reach my first 1,000 beers (all different ones, mind you). Although it took several more years to seriously delve into beer writing, researching, and teaching, let’s face it, it was worth the wait. Travelling the world to learn the geographic, historic, and cultural stories of beer? Yes, please. This book was obviously a huge undertaking. How did you decide to take on a project of this magnitude? Mark: Two of our favorite things to do are drink beer and travel. And if we can combine the two things, it’s that much better. We are good friends. We travel well together and drink well together. It was a no brainer. Don’t get me wrong, it was a lot of work, but I would do it again in a heartbeat. Plus there are hundreds of people who have asked us if we need help. Garrett Oliver is one of the most respected minds in the beer world. How did the partnership with Garrett come about, and what did he bring to this project? Nancy: Garrett has a good relationship with National Geographic, and has worked with the organization on a number of occasions. Combined with his insight into beer styles and varieties around the world, we felt that he could be a great addition to the project, and asked for his recommendations regarding the different regions we covered in the book. 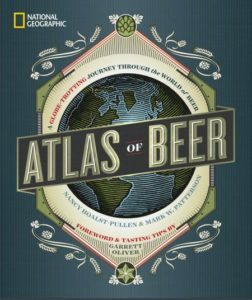 One thing we tried hard to do with Atlas of Beer was to keep our own opinions out of the book and to ask for those from each location, so all recommendations were given by local people in the beer industry—head brewers, assistant brewers, brewpub owners, beer educators, etc.—and, of course, Garrett Oliver. 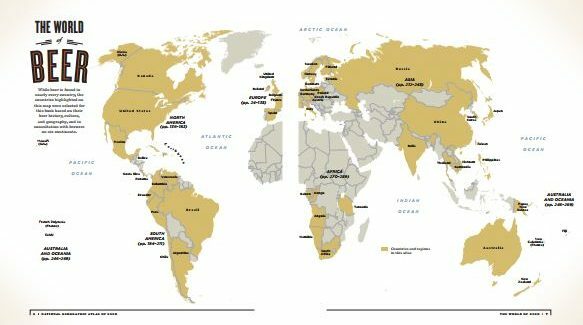 One of the most important things to take away from Atlas of Beer is that good beer is not the exclusive domain of Europeans and North Americans. Nearly every country on the planet has a growing craft beer scene. Which countries surprised you most while you were researching this book, and where should we paying attention that we maybe aren’t already? Mark: For me the two regions that surprised me the most were Argentina and the Nordic countries. These are not necessarily on people’s radar when it comes to beer, but breweries in these regions are producing some of the most fantastic beers—if you can find some. We think the indigenous beers of the Nordic countries have a remarkable history and geography, and we have discussed writing a book about them. Nancy: Yes, I agree with Mark regarding Argentina and Scandinavia, although the latter has such a rich history with farm beers and brewing, I should not have been surprised. Personally, I really liked what I saw in South Africa, and how beer has become a universal imbibe that at times surpasses the suppressive history of this country. There are a few people who are really passionate about beer there, and use it to enrich the local community. There are also some countries that didn’t make it to this version of the book, but are worth mentioning—Lithuania for one. It’s incredible how beer weaves into the cultural fabric of that country. In both Atlas of Beer and your first book, The Geography of Beer, you hone in on the importance of place in the understanding and appreciation of beer. 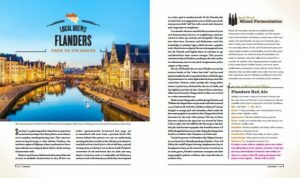 In the current craft beer scene in which breweries anywhere can produce a geographically diverse range of styles, and beers from all over the world can be purchased from bottle shops, what role does geographical origin have for drinkers, and what do we need to do to recapture a sense of place in our beer appreciation? 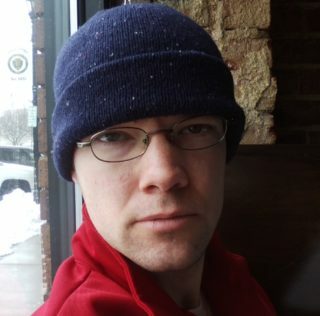 Mark: I think craft brewers are recapturing a sense of place in two interesting ways. First, there is a growing trend to use local ingredients, and in many cases where barley/wheat and hops are not grown locally, brewers are trying local adjuncts like fruits. Second—and this been going on for a while—is the neolocalism movement in which breweries are naming their beers after local icons and using such iconography on their labels. I think as the number of breweries increase, these will focus increasingly on the local, reinforcing a sense of place. Nancy: Mark makes great points. But I think that knowing where your beer originates—both who makes it (is it local? Is it independent? Is it craft?) as well as the origins of the style—can give more meaning to what you drink. It allows you to go beyond “I like it” or “this beer rated well on a given website.” If there is a style you really love, then learning about its geographical, historical, and cultural significance can deepen its importance to you. And who knows, it may lead you to an amazing beercation to its country of origin, where you can further appreciate the style in the locale from where it began. Did you have the opportunity to travel to most of these locations featured in Atlas of Beer? Which country would you go back to first if you could? Mark: We traveled to most of the countries in the Atlas. There are a couple we missed due to time constraints, but are definitely on our list to travel to when the next opportunity presents itself. As for returning to a country, I would go back to Argentina first. Argentina is known for its wine. Brewers are using old wine barrels to age their beers and produce some of the best beers. Juguetes Perdidos (Lost Toys) is a great brewery, of which few outside of Argentina have heard, and they are making simply outstanding beer. That’s where I would go first. Nancy: Yes, we travelled to 28 countries specifically for Atlas of Beer, although we have traveled to more than 70 countries collectively. I’m planning to visit Belgium and Norway very soon, so I guess those would be my first places? However, I’d love to go back to New Zealand. I think there is more there—beer, hops, brewers, beer stories—than I had a chance to fully experience. What’s one beer you had for the first time during your research that you want to try again? Mark: That’s easy. Omnipollo’s Mango Smoothie IPA from Sweden. Absolutely fantastic. Wished I’d had more than two of them. Nancy: I have a couple hundred on my list of “try again” beers. Several are straight-from-the-fermenter beers that I’d put toward the top! If you were to publish a second edition of this book in 5-10 years, what do you foresee as some significant changes in the global beer scene in that time? 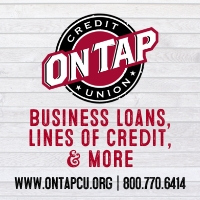 Mark: I think we will see continued consolidation within the beer industry, particularly with breweries producing in the 30,000 barrel range being brought by larger international beer conglomerates. There will be more breweries, but smaller in scale, and whose focus will be the local market. Overall, I think growth both in terms of number of breweries and volume of craft beer (as defined by the Brewers Association) will be slower, but still positive. I think Asia will become the next great market for craft beer. 40% of the world’s population is a huge market that is largely underserved in terms of craft beer. There will also be a wider and greater availability of hops, as newer varieties (e.g. Mandarina, Idaho 7, and Jester) are ramped up in production. And hopefully we will see a continued rise in collaboration among brewers/breweries, especially at the intercontinental scale. Nancy: I agree with Mark on all his points. I think the beer scene will have two dichotomous trends: the consolidation of many breweries by large conglomerates, and the increasingly hyperlocal beer scene that interacts with and influences the local community. This trend toward the hyperlocal may resemble the way the beer scene was hundred or more years ago, where people go to a location in their neighborhood where they know the brewer and can see the process first-hand. But above all, I think the term “craft’ will likely need to be re-evaluated. What does craft mean anymore? When big companies make small beer styles, it is craft? I look forward to how the craft beer scene evolves and develops in the upcoming years. With the evolution of beer, and the increasing number of styles worldwide, I think historic and extinct styles will be recrafted by homebrewers and brewers alike, and gain popularity with time. I see these trends with such historic styles as Poland’s smoky grodziskie, and Germany’s sour wheat gose and Berliner weisse. I don’t know how long the popularity of these specific styles will last, but I do think the attempt for resurrecting old styles might be at the forefront of the craft beer movement for a while. Finally, the most important question of all: Which beers have you been enjoying lately? Mark: For me it changes with the seasons. This summer I enjoyed the IPAs from Burial out of North Carolina. Delicious! Nancy brewed a gose that was quite refreshing and the perfect summer beer. As the weather starts to get cooler, I’ve been enjoying Prairie Artisan Ales’ Bomb! It’s an imperial stout aged on coffee, chocolate, vanilla beans, and ancho chili peppers. Delish! Nancy: I like to brew beers. I made a nice gose this summer. Right now, I’m enjoying sours. Currently in my fridge (hopefully to drink sooner than later) are Thornbridge Days of Creation, Rodenbach Alexander, Nøgne Ø Kriek of Telemark, and Creature Comforts Athena, among others. However, when the seasons change, so will my preferences—I drink with the seasons!